I get asked all the time how to make cooking at home easier and faster. And my answer is often based around creating a freezer stockpile of leftovers and partially prepped ingredients that you can pull from when needed. One of my favorite things to stock the freezer with is cooked chicken breasts. I know you are probably picturing dried out, rubbery, reheated chicken but if you follow this recipe that is not the case! It comes out juicy and tender even after a stay in the freezer, ready for you to use to top salads, toss in pasta, make tacos, etc. etc… Thanks Sandy (my mother in law) for this time saving and flavorful technique! 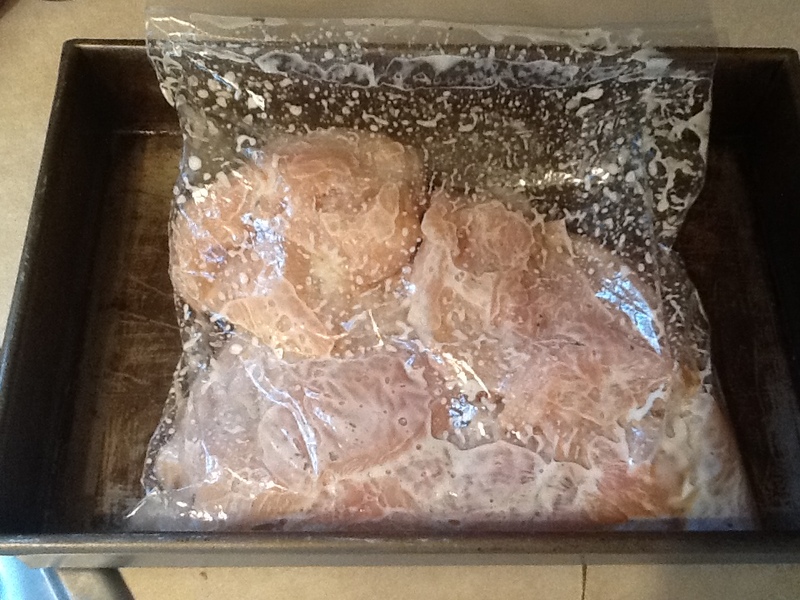 Cut away visible fat from chicken breasts and place in a ziplock bag. Pound the chicken until evenly thick (approximately 1-2 inches). Don’t skip this step as it will help tenderize the meat and ensure that it cooks evenly. Pour ranch dressing over the chicken and reseal the bag. Ranch dressing works well because of the acid in buttermilk but you can also use plain yogurt, or for those of you on a dairy free diet I also sometimes use italian dressing. Gently massage the chicken so that it is covered in the dressing (see picture above). Place in the refrigerator to marinate for 2-3 hours. Grill until done. If you plan to freeze it, grill until slightly underdone (still pink in the center) so that when you thaw and reheat it doesn’t get dried out. Make more than you plan to eat and freeze the leftovers to save you time in the future. When freezing, wrap each breast individually in plastic wrap and then place several in a freezer ziplock bag together.